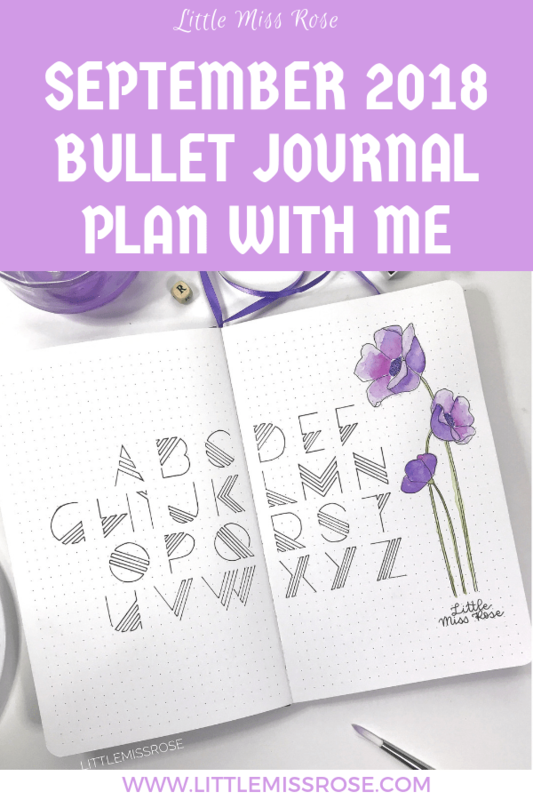 Wholly crap, it’s been almost a year since I last posted a Plan With Me on this blog. I don’t know why I haven’t done it more regularly, maybe because I never seem to have my month ready before the month starts. But that shouldn’t matter as these posts can be used as inspiration for any month right? This month is a bit different though. I completed my last journal which was a Dingbats* Wildlife notebook and this month I started in an Archer and Olive dot grid journal. 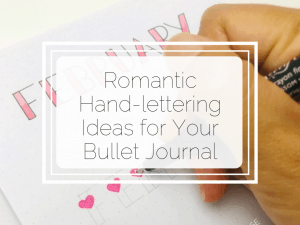 I’ve been dying to try out this journal for a long time. Mostly because I really wanted to use more watercolour in my planning and sadly the Dingbats* notebook did not take watercolour well at all! The Archer and Olive notebook however has pages which are 160gsm which are gloriously thick and white and they handled my novice watercolour attempts like an absolute champ! There was next to no wrinkling and no bleed through at all! I would highly recommend this notebook if you want pages that hold up to water well. 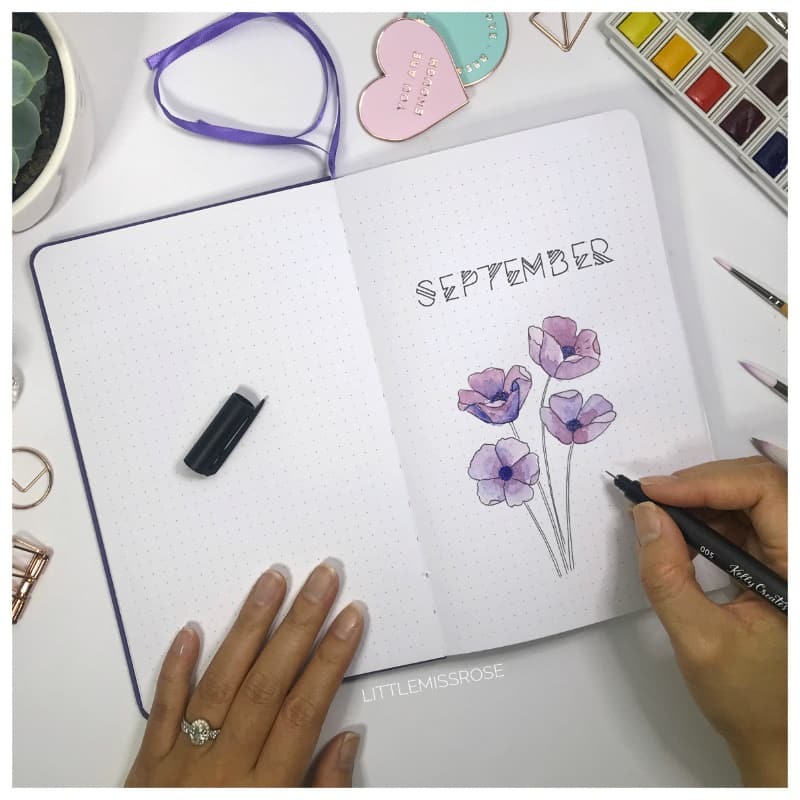 My theme for this month is minimal watercolour flowers – say what? What I mean by that is simple watercolour used alongside simple clean spreads. You can see for yourself what I mean below! 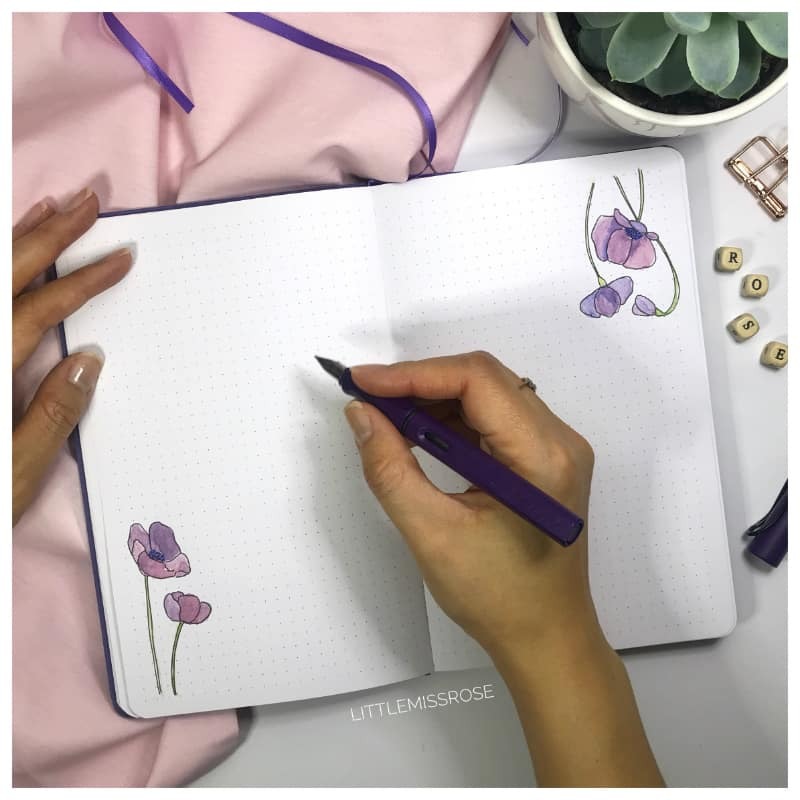 For my September cover page in my bullet journal, I decided to paint watercolour poppies. For these I first drew the flowers in pencil then used my Winsor and Newton Cotman travel pack to paint in the flowers. I outlined the flowers using a black Kelly Creates fine liner. While painting these, I discovered that I don’t actually own black watercolour paint so I ended up painting the centre of the flowers with a dark blue and then I used a black finaliser to stipple in some colour. 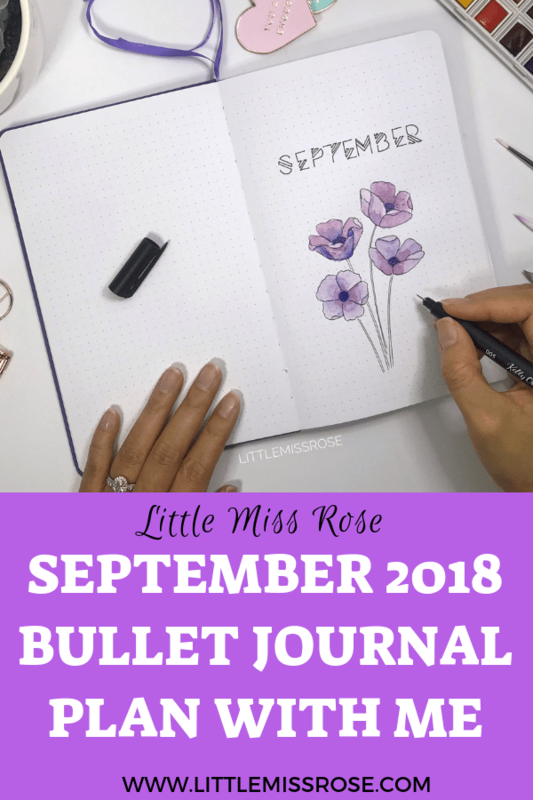 The font I used for “September” was something I found on Pinterest. Because so many people over on Instagram asked for it, I also decided to recreate this whole alphabet on a double page spread below. 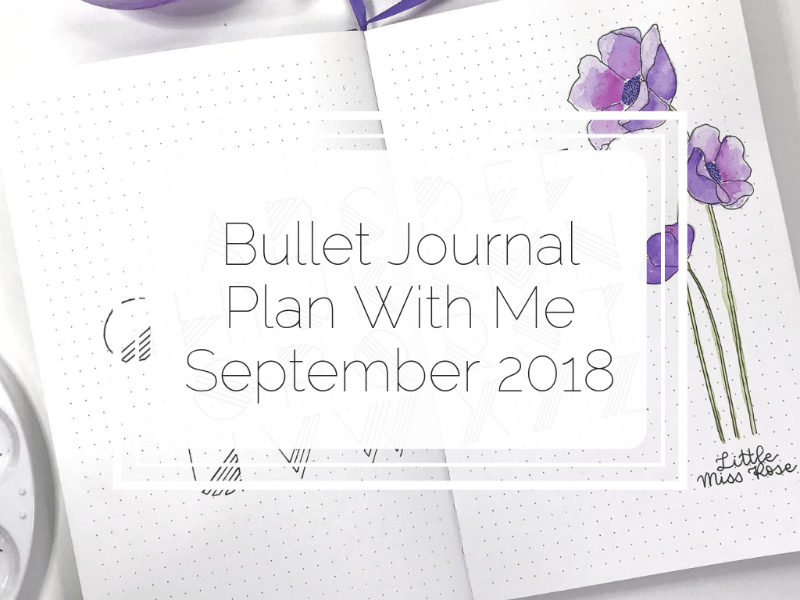 Next up I created my bullet journal monthly log. 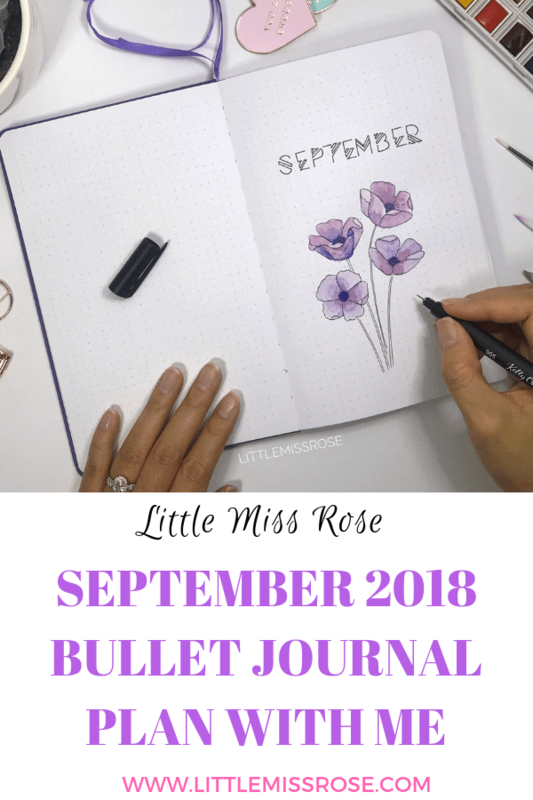 This month I decided to go with the original bullet journal monthly log format, which is to write the dates and days of the month down the left hand side of the page. Then you just add your appointments, tasks and reminders next to the corresponding date. To make this a bit easier to use I used a Tombow Dual Brush pen in colour N95 to highlight the weekends. On the facing page, I created boxes in order to note down and other important tasks, goals and notes I would need for the month. The three boxes categorises my tasks goals and notes in to the three categories “Work”, “Personal” and “Blog”. 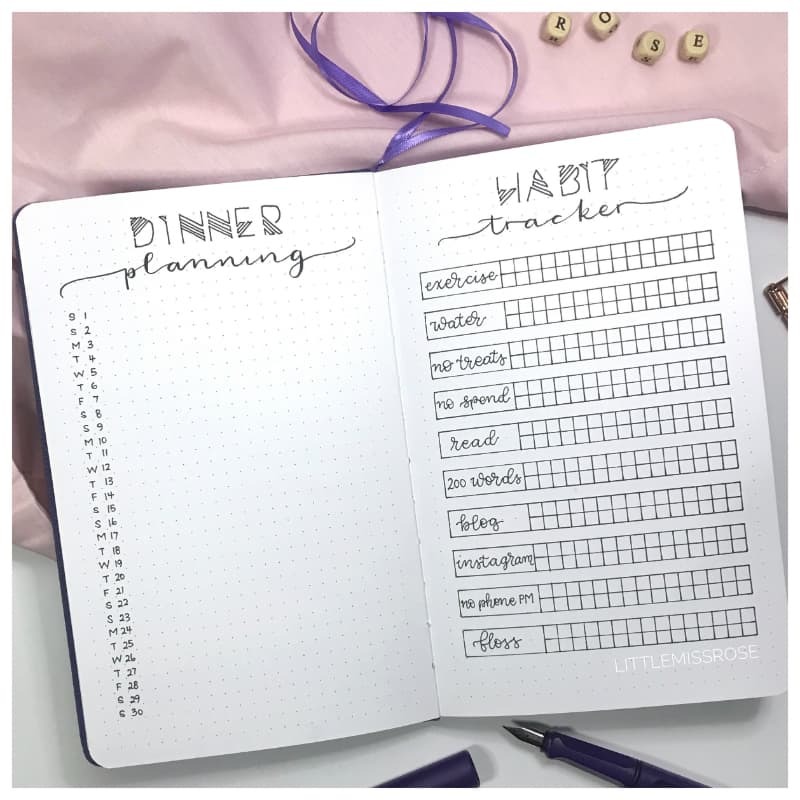 On my next two pages I’ve added a meal tracker which I’ve labelled “Dinner Planning” this month. Down the left hand side are the dates of the month. Next to these I’ll note down what we had for dinner each night. This serves as a reminder of what we’ve eaten. 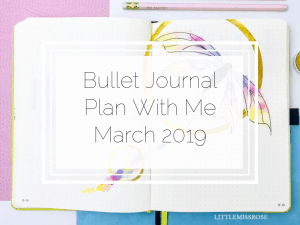 In future when I’m stumped with ideas for what to cook for dinner, I usually flip back to these pages in my bullet journal for ideas of something we’ve had in the past that I haven’t cooked for a while. It doesn’t sound it, but I do actually find this really useful. 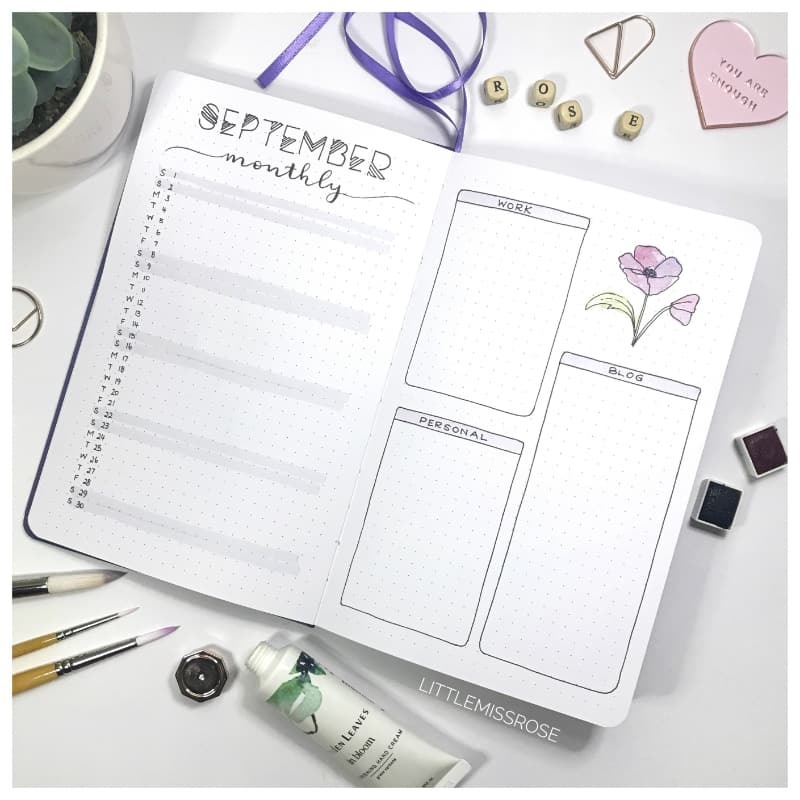 On the right hand page I’ve created a simple habit tracker of 10 things I want to track this month. I’ve left 30 little boxes for each habit which I will fill in when I’ve completed the habit at the end of each day. I decided not to number the boxes with the dates as I prefer the minimal look of leaving them empty. But this does make it harder to fill in! 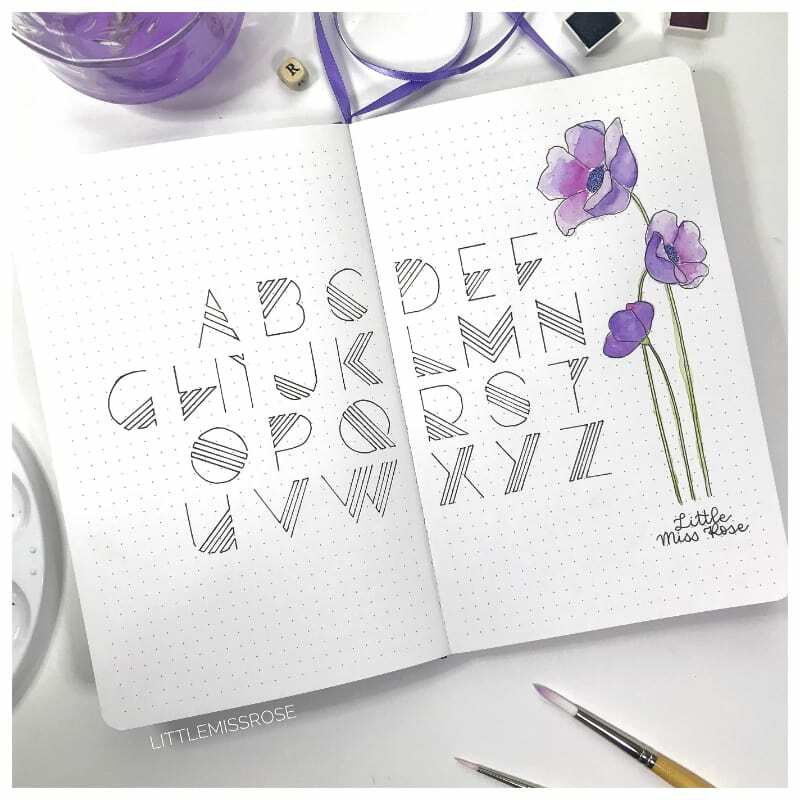 I’ve used the same font as before and for the cursive lettering underneath I used a Tombow Fudenosuke brush pen. On the following pages, I’ve more or less left these blank for journaling. I’ve added a wee bit of watercolour floral decoration in the corners. Every few days or so, I like to sit down and journal in significant events that have happened, memories of my wee boys or just my thoughts and feelings. Next comes my first weekly spread for the month. 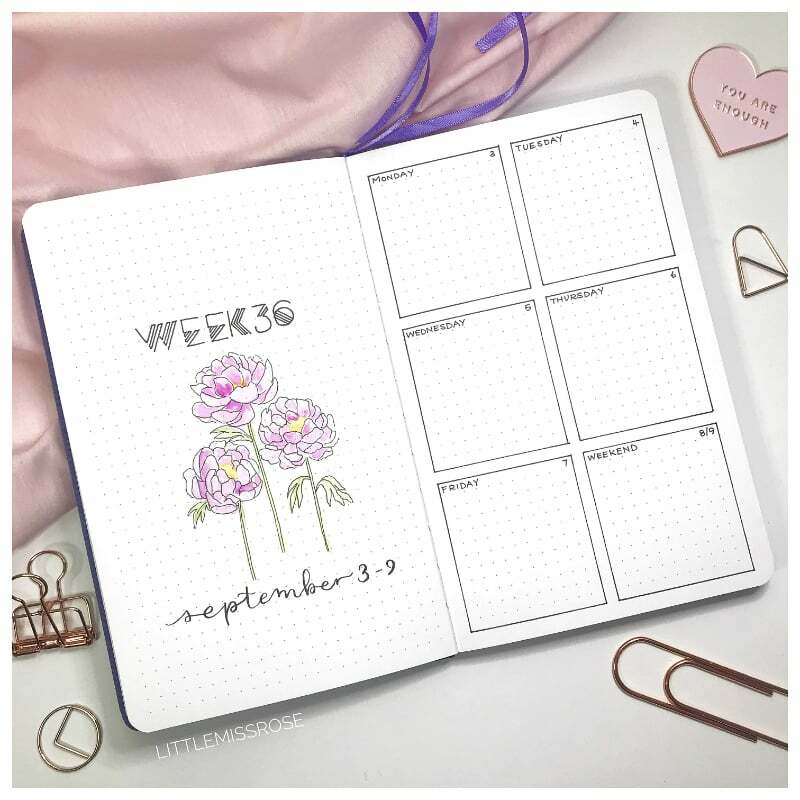 This week I decided that I would keep things super simple with a simple decorative page on the left and six boxes on the right hand page for my actual weekly tasks etc. The six boxes are one for each day of the week from Monday to Friday and a box for the weekend. I haven’t used much space for my weekly this week because the past month I have used a full double page spread for my weeklies and found that I never had that much to write on my pages. 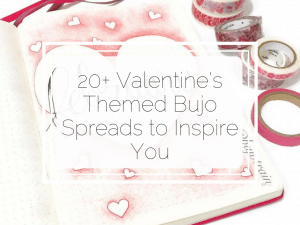 I hope this post has provided you with lots of ideas and inspiration for your future spreads. If you happen to recreate any of these spreads, please please please tag me @littlemissrose in photos of them over on Instagram or use #LMRfeature. 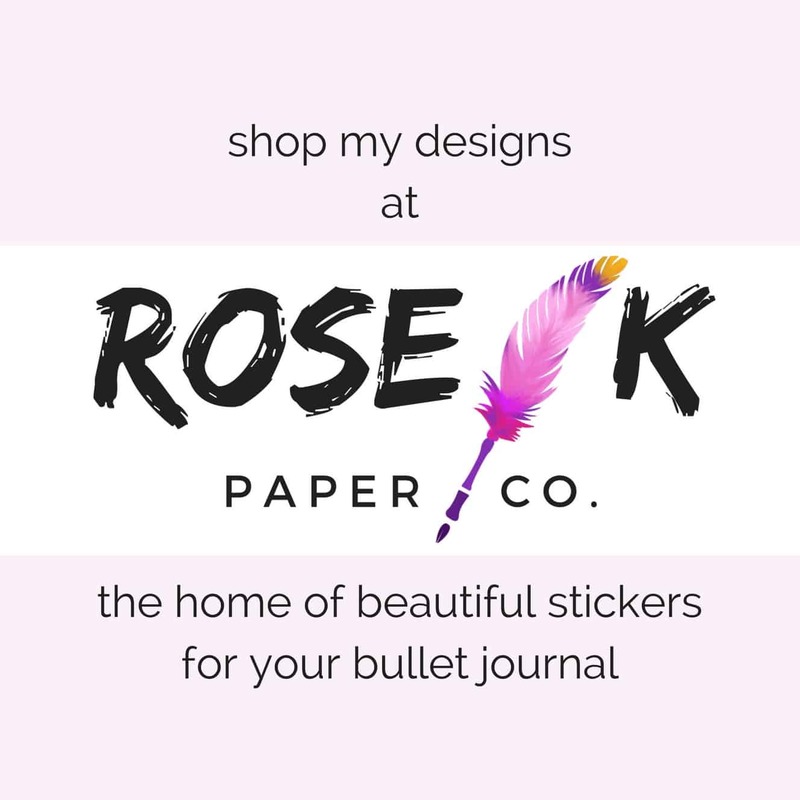 I’d love to be able share with everyone else! I love everything about this! Gorgeous layout and well thought-out instructions. Thank you! May I ask where you got that beautiful light pink heart that says “you are enough”? I think I need that in my life, too. Thanks so much for your comment! I don’t feel like I’m naturally artistic, but I just give it a go and hope for the best. I’m so glad this was helpful to you! That heart is actually a magnet that I got from Kikki K!